Have you ever wanted to try a Starbucks double espresso? This coffee will come close to that experience. The only problem is, you may not find either a good thing. There’s not much aroma coming from the package when first opened. The color of the beans is a little darker than the indicated medium roast. The beans also have more oil on them than might be expected from a medium roast. The beans vary in size. Some are rather large beans. When brewed in a coffee press, the coffee was bitter and left a feeling of fine grit in the mouth. The fine grit thing was interesting, but unwelcomed. Even when brewed through a standard drip coffee maker filtered through a paper filter, that fine grit feeling was still there. It and the bitterness were reduced as the coffee cooled. Overall, this tastes like a lesser coffee than just about all the other Trader Joe coffees reviewed here. If you’re a Starbucks double espresso person, you may like this. For the rest of us, it’s probably better to leave this on the shelf. This entry was posted on 06/12/2018 at 08:29 and is filed under food, Recipes, food, cooking and related items, Trader Joe's. You can follow any responses to this entry through the RSS 2.0 feed. You can leave a response, or trackback from your own site. My friend lives in Timor Leste I wonder if she drinks this coffee. No doubt she’s at least tried coffee from the local beans. At least the way my beans were processed and roasted, it makes a pretty intense cup of coffee. 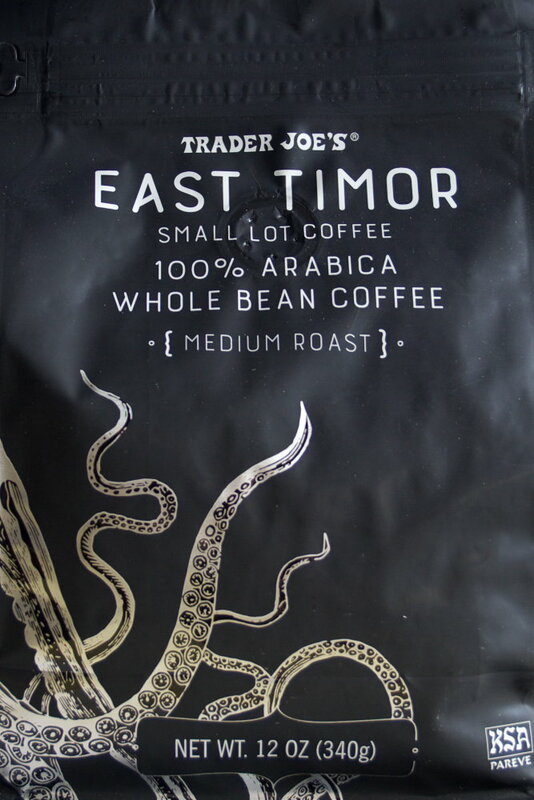 Surprisingly, Starbucks has been the biggest single customer for Timor coffee beans. I’m not a coffee drinker but what I get out of this is that this coffee was not very good, similar to Starbucks’ double espresso. Not very good at all. At least for me. This alone would convince me to drink more tea. Or maybe beer. Okay, more beer followed by more tea. And water.